More special jewelry in this week that is so special & unique! Inspired by Navajo, Zuni, and Hopi cultures, these designs reflect an unexpected contemporary energy, setting creations a step ahead of tradition. Incorporating his mastery as a silversmith and talent as an artist in "stretching the Imagination of creativity...It's all about the colors of the stones, how they mix with metals, and nature's use of light. 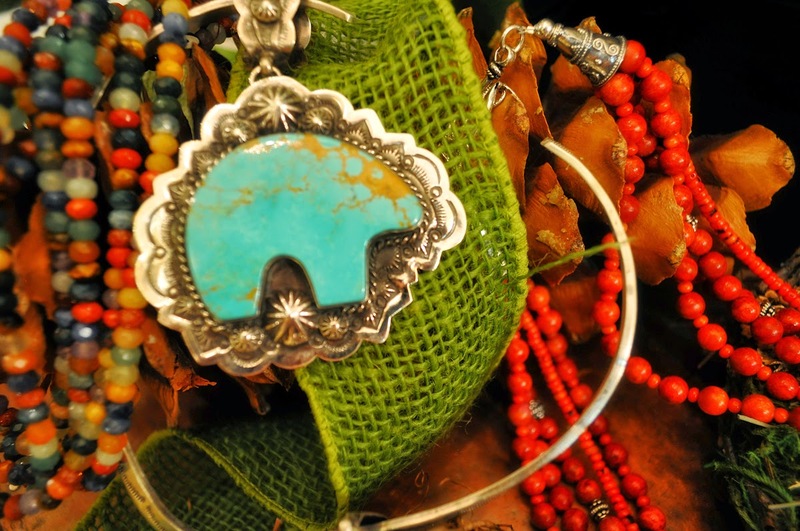 "….Featured in the finest galleries across the southwest come in and let us show you our new pieces commissioned by a New Mexico silversmith and talented artist. Large sterling Silver Bear Pendant in the beautiful Blue Kingman turquoise. Gorgeous with the sterling silver beads. Bright and colorful Dragonfly Pendant is set in mojave turquoise, spiny coral, and sleeping beauty turquoise eyes perfect for summer…Another large Mother of Pearl Pendant surrounded by sterling silver embellishments has also arrived…it is so pretty with our new single strand mother of pearl necklaces. 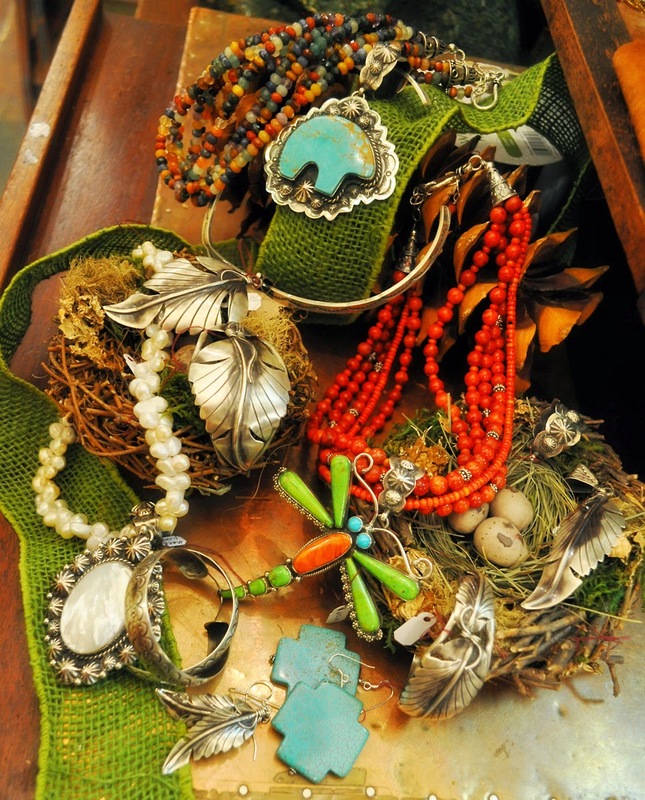 The artist's new collection is vintage silver Feather pendants, cuffs, and earrings…beautiful for Springtime! 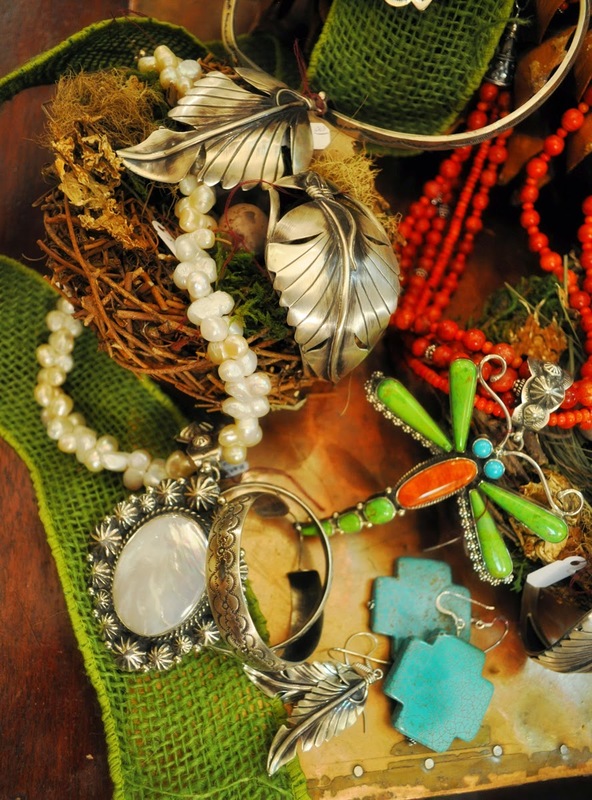 He also specializes in the large sterling hooped earrings and popular stamped sterling collars. Each design is handmade and handstamped a very talented silversmith and artist. The artist's Large Kingman Bear pendant is quite special! Looks lovely with our new multi strand Blue Lapis necklaces, and the five strand Red Coral necklace with silver embellishments as well. We also have in a gorgeous five strand Semi Precious Multi Stone necklace that is so pretty with the large Feather Pendants. Awaiting the arrival of the Large Antiqued Single Strand Silver Beads and our wonderful Copper Beads again….